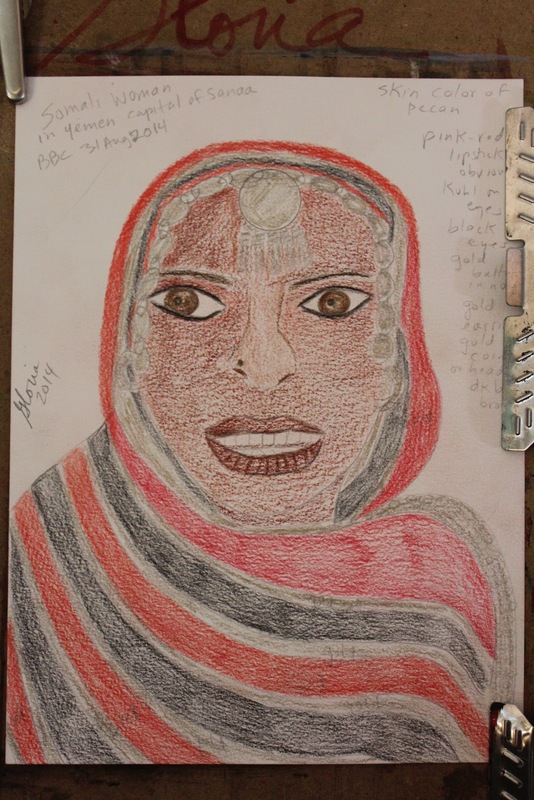 Preliminary drawing in watercolor pencils and graphite of above sketch of "Somali woman in Yemen" on paper 9 x12; by Gloria Poole of Missouri . I repainted this in acrylics that is shown above. 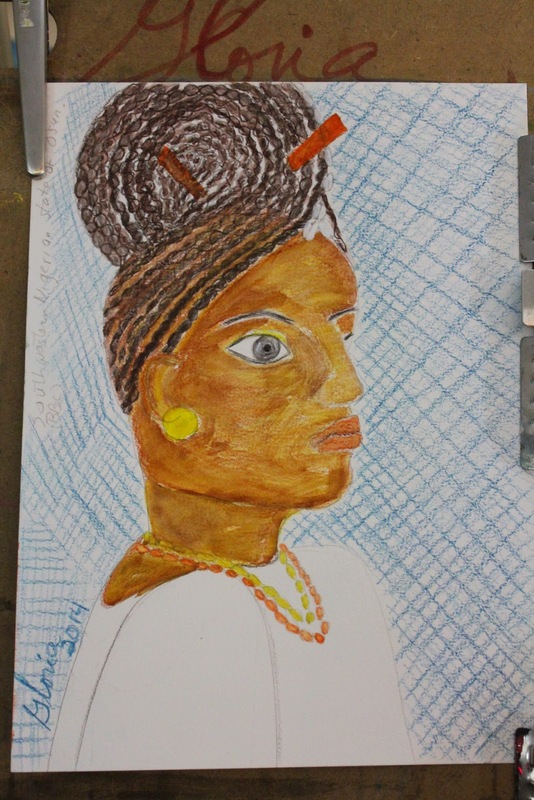 Ethnic series sketch of "Nigerian married woman at Festival" by Gloria Poole of Missouri, Sept 2014 in acrylics on 9 x12 paper. 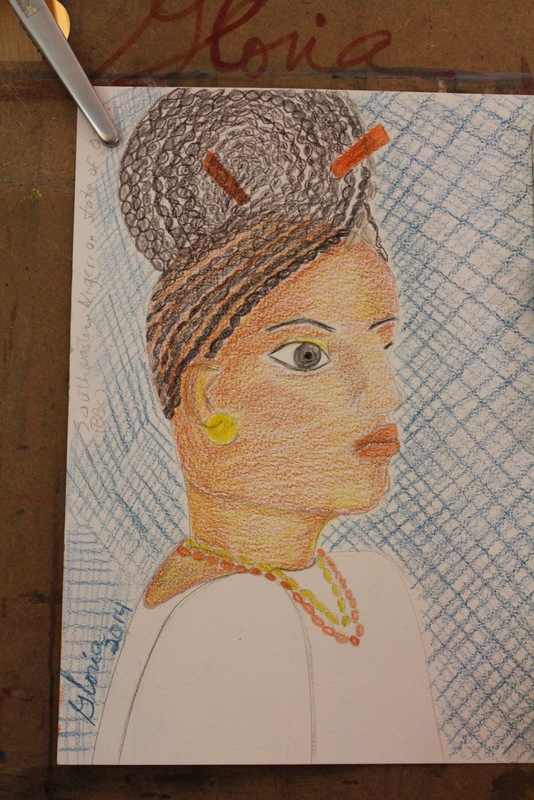 Preliminary drawing by Gloria Poole of the sketch "Nigerian married woman at festival" that is above this one. This is the first drawing in watercolor pencils and graphite, that I repainted into acrylics. 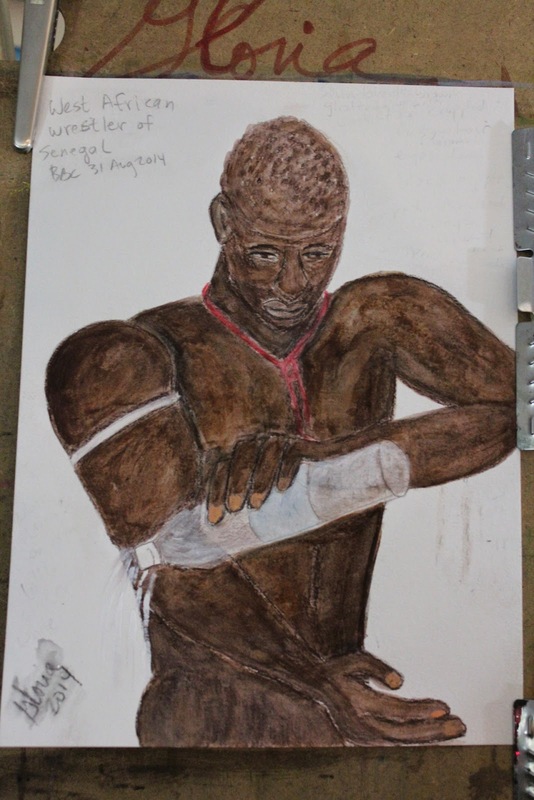 Ethnic series "Senegal, Africa wrestler" sketch by Gloria Poole of Missouri, Sept 2014; acrylics on 9 x 12 paper. 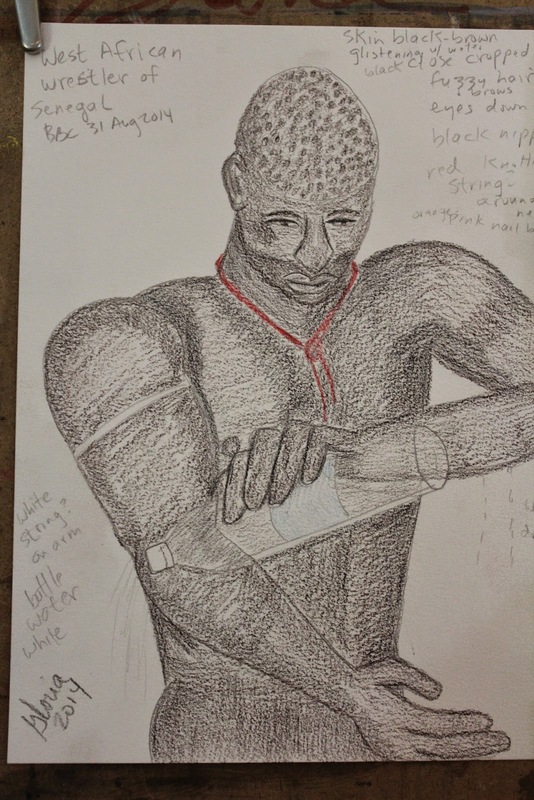 Preliminary drawing for ethnic series sketch "Senegal wrestler" as shown above in acrylics. This is the first drawing in graphite and watercolor pencils that I re-painted with acrylics as shown above. 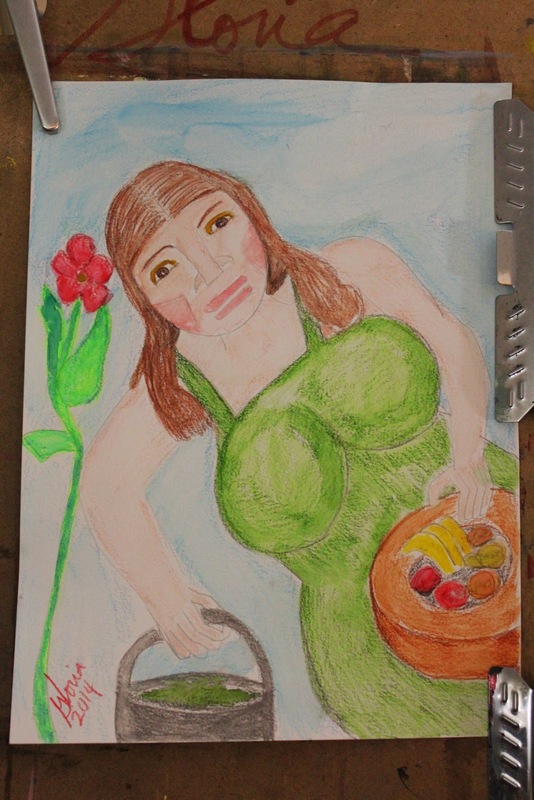 Also see the sketch that criminals at remote tried to steal below this copyright notice that is named "getting lunch" of a migrant farm worker not native to U S.
Ethnic series sketch named "getting lunch" of a migrant farm worker not native to U S; sketch by Gloria Poole of Missouri. I also drew this in watercolors and graphite as a preliminary drawing and photographed the preliminary drawing but criminals at remote stole it as I was uploading it from my camera. The theft of photos of art I create and genre photos I photograph has been an on-going problem since year 2007. Copyright notice: this blog and all content on it is created by me and owned by me Gloria Poole residing in Missouri but born in the state of Georgia, and it is covered by U S copyright law. This blog and or its individual posts may not be transferred to anyone anywhere, nor have domains forwarded to it that do not belong to me, nor be saved to disk, nor downloaded, nor printed at remote, nor copied, nor photo-copied [screen-captured] , nor in any way wit any method be reproduced. I, Gloria Poole, own all rights to all words, art and photos I create with any method of technique or medium on any surface anywhere any location any reason or no reason, whether or not I photograph it on any camera, phone, etc, and whether or not I publicly display it anywhere. I have never signed a blanket waiver of my copyrights to art I have created and do not have an artist's rep [agent] nor a literary agent to represent me, and never did]. I drew, painted, signed, photographed and uploaded all art on this blog and on any blog of mine. For the record and to establish provenance of art I have already created also: the art I have created and signed and posted to this blog of mine is part of an on-going series of art I created since year 1991 beginning in Atlanta, GA that "blossomed" in year 2005 in Aurora, Colorado when I lived there for one year [May 2006-May 2007, and art began to really become an integral part of my efforts to save the baby humans from premeditated destruction. In 2005, I began to realize I could use the art to illustrate my talking points in some cases, and to build a secondary "career' for me as artist. In the year 2006 when I had endured and lived to tell about it a violent crash down a flight of stairs and had trauma, fractures, concussion, because my then-husband DBP was scheming a way to kill me to 'make it look like an accident" and he violated restraining order, timed me with watch, threathened me, set me up to crash down flight of stairs, then when I did he tried to twist off my broken leg, I had immobility for months except on crutches. As I sat with leg propped up I began to draw daily and paint to occupy the time and my mind. I also began to post art to the web on my blogs and websites, and also photographs I had photographed. 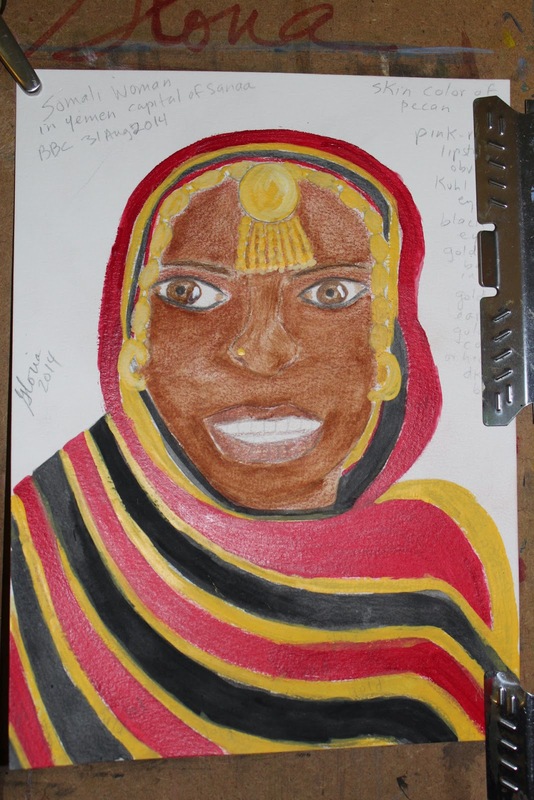 I began a series of art then that is named "ethnic series by Gloria" [me] to attempt to draw and paint an art work of every ethnic group tribe, language, culture in the world and I created eight initial oil paintings in the first batch and posted them to the web on domains of mine. I moved from Aurora to zip code 80203 for 2 and 1/2 years and then moved to Missouri on Oct 31, 2009 with the art I had in my possession at that time. I paint some of the sketches I created in do-overs into oils on canvas and those are very visible on the web. I put many of them on my mini exhibit of art at https://mini-exhibition.blogspot.com, and also on my Picasa albums at https://picasaweb.google.com/gloriapoole. I, Gloria Poole, am a white, Southern Baptist Christian, woman, single-again, twice-divorced,natural mother of only two children who are grown daughters named Jennifer and Leigh, and also a republican, personhood promoter, prolife activist-blogger, photographer, artist in all mediums, poet, author, illustrator, cartoonist, writer, University of Georgia alumna, U S citizen born in the state of Georgia [but I lived in several places including New York, UK briefly, Nebraska, South Carolina, Colorado, Virginia, North Carolina], former TV producer,tweeter, Registered Nurse licensed in Missouri [but before that in Georgia, UK, other states], writer/owner of/ for words that WORK, and Tapestry of LIFE, and citizen journo . Gloria Poole is my real, born with legal name and I resumed my full maiden name including my surname of Poole legally by Court order at the time of divorce from male DBP in Colorado in Oct, 2007 at Centennial, Colorado; and I also removed the Pappas name from my name forevermore at the time of final decree in Oct 2007 . I was glad to end that four year horrible marriage of multiple trauma and injuries to me caused by male DBP, [which I testified about in Court on several occasions ]. That second divorce is public record in the state of Colorado, and my first divorce is public record in the state of Georgia. I have created art regularly since 1991, and I had formal training in drawing and in mixing colors /paint and painting in oils and I post much of the art I create on blogs of mine. You can see some of that art on one of my name blogs at https://gloriapoole.blogspot.com and see the about me page of that blog for the list of art blogs I own and post art too, that are all different. This took 5 tries because criminals at remote broke into my account. Copyright Notice: Gloria Poole; also known as Gloria on art I create and sign, and as Gloria Poole and "Gloria Poole, RN, artist; and on the web as: gloriapoole; gloria-poole; Gloria Poole; artist-gloriapoole; gloriapoole.RN; gloriapooleRN at yahoo in which the RN is the standard abbreviation for Registered Nurse; photo-by-gloriapoole; cartooning-by-gloriapoole; @gloriapoole; and other variations of my real, born with, legal name of Gloria Poole at my own, private apt in Missouri which is not shared with anyone on Sept 5 2014 at 11:02am..